Week ending 30th November 2018. Trade and the Fed remained front and centre this week. I appreciate that many clients are getting bored with me going on and on about US interest rates, but as the adage goes: equity bull markets don’t die of old age, but are killed off by the US Federal Reserve. And given the Fed has been slowly withdrawing monetary stimulus (it has increased US interest rates eight times in the past three years to a range of 2%-2.25%), and has previously indicated another four increases should be expected by the end of 2019, the recent equity market downturn has been fuelled by concerns that the Fed would overtighten. Policy error by the Fed is a serious risk, as increasing US interest rates too fast and by too much will slow US economic growth (higher interest rates means higher borrowing costs for companies and consumers, which reduces corporate profitability and reduces consumer spending – and it should be noted that the US consumer accounts for more than two-thirds of US economic activity). Therefore, much to my relief, the Fed chair, Jay Powell, made a fundamental shift on Wednesday (28 November 2018) when he signalled that the current level of US interest rates was “just below” neutral (i.e. a rate that supports the economy and employment without generating above target inflation). He also stated that the Fed was now very much in data-dependent mode – which to me, significantly reduces the risk of the Fed overshooting. While the Fed is highly likely to increase interest rates again in December given the current headwinds (slowing overseas economies; fading fiscal stimulus in the US; and the lagged economic impact of the recent interest rate increases), it is likely that the Fed will now have a much slower trajectory of interest rate increases than indicated in the Fed ‘dot plot’ for 2019 and 2020 – and hopefully the Fed will be hinting at a cut in the not too distant future. 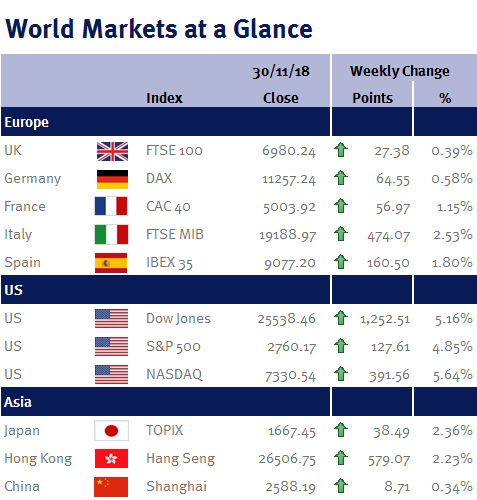 Consequently, financial markets reacted as one would expect to Jay Powell’s shift: equities were up; bond yields were down; and the US dollar weakened. In fact, the S&P 500 had its best day on Wednesday since March 2018! Additionally, yesterday’s (Thursday 29 November 2018) PCE data, the Fed’s preferred inflation gauge, should also give the Fed another reason to be dovish: the headline reading was bang in line with its target at 2%; while the core rate, which is a better indicator of underlying price trends, fell to 1.8% from 2%. All we need now is an end to the trade war. And if Donald Trump and his Chinese counterpart, Xi Jinping can start to make some serious progress over a working dinner tomorrow (Saturday 1 December 2018) during the G20 summit, then a reversal of the recent equity market weakness may be just around the corner given the level of pessimism that is already priced into markets. However, given the continuing Brexit uncertainty and potential for shifts before Parliament votes on 11 December 2018, we are remaining overweight in cash with a commensurate underweight to the UK (as it is difficult to be proactive before the vote). We have not changed our views (or your portfolio positioning), aggressively from those in the commentary that accompanied your October valuation and the Quarterly Market Outlook (written by my colleagues Peter Quayle and Jonathan Wiseman). With reference to Brexit, while I expect Theresa May will lose the first vote, I believe the probability of a no-deal Brexit is small – after all this is politics and we have seen it time and time again: loud noises to appease voters, then small tactical tweaks that allow all sides to sell the final agreement as a win. However, we can’t rule out the risk of a Jeremy Corbyn government if there is a snap election. This coming week, Friday’s (7 December 2018) employment data (non-farm payrolls; unemployment rate; the participation rate; and average earnings) is the week’s key US economic event. We also have the Fed’s beige book report on Wednesday (5 December 2018).